During my search for a wedding dress, I reluctantly decided to sign up on The Kn*t website (that is not the proper spelling, but it does properly reflect my opinion of it). Reluctantly because I had a pretty good idea of what to expect: "What is your engagement ring IQ? (Are you participating in the Diamond Olympics?) Did you remember to book a calligrapher for your invitations? Are you planning a receiving line? (Huh? Does this have something to do with football?)" But I signed up anyway because I heard they have a pretty good collection of wedding dress photos. Which, it turned out they do, but not so much of the kind of dresses I am looking for. When you sign up for an account, the Kn*t asks you for your wedding date, even if it is just an estimate. So I provided a wild guess estimate (sometime next summer), and it generated a convenient To-Do list for me. As you know, I love check lists, but this one sent me into a hysterical fit of laughter in about two seconds: "You have 188 items on your to-do list, and 21 of them are overdue!" Really? I just got engaged, and already I am so desperately behind? I guess I should have started planning my wedding when I was five years old. Oops. Luckily, you can delete items off your list, which I did with great satisfaction. Items like calligrapher, receiving line, and spa appointments were happily removed. I feel so accomplished already! Wedding planning involves such an overwhelming number of "musts" and "shoulds" that one can go insane pretty quickly just trying to keep track of all these "requirements". Even if you avoid all these prerequisites and start from scratch, it's still pretty difficult to figure out what you want to include in your wedding. However, it's actually pretty easy to figure out what you DON'T want to include, so here is my list. No long, elaborate, poofy gown for the bride. I mean seriously, who wants to put on 20 pounds worth of dress on? That requires assistance to use the bathroom?? A dress in which I cannot dance, let alone move??? Not this girl. I am going to wear a short dress! No veils or bird cages. I don't really see the point of veils. Am I going to be hiding behind it from my groom? Because, what, he doesn't see me every day? Surprise, honey, this is what I really look like behind that veil! Why don't you look surprised? Yeah. And bird cages. What is UP with that? I'm not a bird and I don't want to be caged! While we are on the fashion topic, no ridiculously high heeled shoes for the bride (as in, me). I would prefer not to start my married life in pain and covered in blisters, thankyouverymuch. So, cute and shiny flat sandals it is. And by the way, no matching dresses for the bridesmaids. Or groomsgirls. Or, as we like to call them, the Inner Circle. Because I'm pretty sure these smart women have already figured out what cut and color dresses look good on them, and they probably already own the dresses they love. Oh, and because this is a wedding, and not a huge production, no out-of-control guest lists. If neither of us have met you, you are NOT INVITED! That should pretty much eliminate any requests for inviting parents' favorite coworkers. No religious ceremony. Because neither of us is religious. And if we went with a religious ceremony, I have no idea how we would do that. Would it be some sort of Jewish/Catholic/Protestant/Buddhist mashup? Way too complicated. Therefore, not happening. No wedding planners. Because I already have an obsessive-compulsive type A personality, and I can manage my own elaborate spreadsheets. That's a lot of No's for one post, so let's wrap this up on a positive note. What would I like to see at our wedding? Lots of smiles, laughs and dancing. A wonderful celebration with our closest friends and family. Happy memories to last us a lifetime (cheesy but true). And of course, the most important thing, being married to D at the end of the day. Remember how I said that we are diving right into wedding planning already? Well, it turns out we had to slow down a bit because making decisions together is a much slower process than me making a decision on my own. So while we are trying to agree on the guest list, the budget, and the venue, I figured that I might as well start planning the one part of the wedding that I have complete control over - my wedding dress. Although I don't have a specific kind of dress in mind yet, I do have some ideas on what I want and what works for my body. For starters, I would like a short wedding dress. As in above the knee but not shameless-hussy-type short. And this eliminates a whole lot of options. 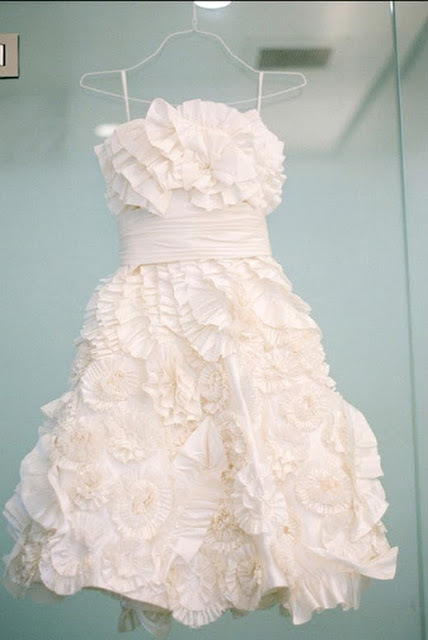 It seems like most wedding designers don't really consider a little white dress as a feasible wedding dress option. A reception dress? Sure! An engagement party dress? No problem! But no one actually gets MARRIED in a short dress, right? Grrr. Anyway, even taking all those "additional wedding dress" options into account, the selection is pretty dismal. Exhibit A. Mmm, I'm getting hungry just by looking at it. Exhibit B. Is that a cake or a bird? Exhibit C. Not very yummy cake, but still quite poofy. Exhibit D. The hot horizontal dress. It has the sweetheart neckline and a defined waist. And I actually do like the lace. Unfortunately, the skirt of the dress reminds me of curtains when the model is standing up, and I do not intend to spend the majority of my wedding horizontally. I like this dress as well, I just wish it was a little longer and not as tight on the bottom. Also, the back is way too low-cut for my taste. Maybe the V-neck is a bit too deep, but I still like the idea of it. Exhibit E. V-neck, defined waist, and lacy. All dresses were found on Pinterest. Those with sources for original websites are linked in the post.